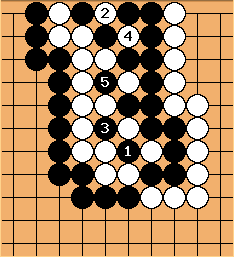 A Quintuple Ko is an extremely rare situation in which there are five interrelated kos, and a resulting cycle of ten moves, which will result in a void game under some rules, or in a complicated ko fight under others. There is no known example from professional play, but it is rumoured to have occurred in amateur play in Japan. An example from actual play would be most welcome. For an example, see Quintuple Ko. 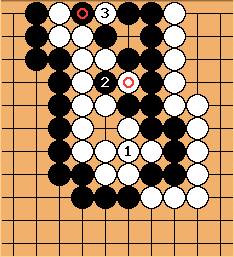 With the moves - , the position has reversed to the next diagram. This is symmetric with the previous diagram, so white start another series of 5 moves to return to the original position. 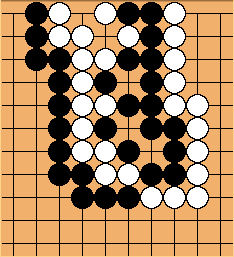 Now, black is dead, because even if black retakes at , white can take at as an internal ko threat.